Krista Wagner was born in 70’s Southern California. She lives with her Marine Corp veteran husband, three very entertaining children, and an indispensable faith in Christ. She holds an MFA in Creative Writing and is an English adjunct instructor. Fabricio Correa: In your novel Intent, the protagonist Raylee Johnson lives a sheltered life in a small town. Do you share similarities with Raylee’s upbringing? Krista Wagner: Not really. My parents divorced when I was a baby and I grew up in the city. Both my parents were not Christians. The one thing Raylee and I have in common is that we are both an only child. FC: The bleak setting possesses an aura of mystery where water is a character itself. How does water as an element interact with the Protagonist? KW: In two primary ways: as a place where she finds comfort in the company of her loved ones (her parents, Billy) and as a place of revelation. In the second half of the novel, the water begins to serve as a metaphor for unease and danger as Raylee starts to unravel the mysteries behind the deaths of those close to her. FC: Raylee starts out as an impressionable, naïve girl living with her overprotective parents. Do you think her parents somehow contributed to her being unprepared to go out in the world by herself? If not, do you think all the love they gave her actually made her stronger than any adversity? KW: I think her parents believed in her more than she believed in herself, so it was more of Raylee’s insecurities that created this doubt. And, ultimately, her parents love and the faith they supplied gave her the courage she needed. FC: Raylee encounters tragedy in her life which shatters her “glass house” existence. How did that shake Raylee’s expectation of self based on her dependent demeanor? KW: She became bitter. The faith she grew up in became fractured and redirected into her high school crush, Billy. FC: Religion has a crucial role in Raylee’s life. Her tragedies made her question her faith only to allow it to grow stronger inside her. How do you see the connection between hardship and faith? FC: Your novel is set in the 90’s. How do you think your novel affects the digital era teen? KW: It reminds us of how much simpler life was without all of the technology and how much more people interacted face-to-face. I’ve had younger readers experience a nostalgia for something they never had. FC: Tell us about your academic background. KW: I received my BA in English from UMBC, my MA in English Composition from CSUSB, and my MFA in Creative Writing from National University. 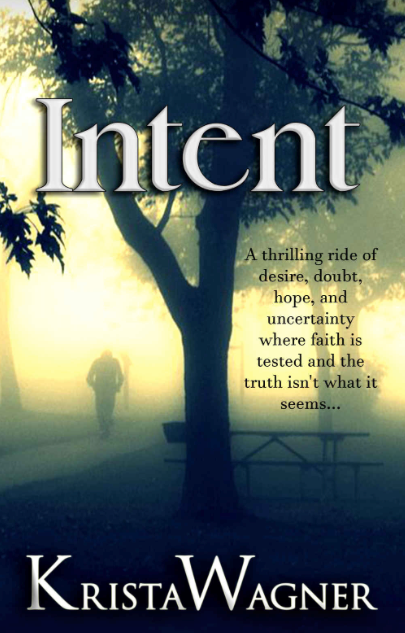 My debut novel Intent, a spiritual dramatic thriller, was published in 2014. Rian Field, a psychological thriller, The Gold, a middle-grade fantasy, and indigo, a YA realistic issue-driven novel, were published in 2016. I have been an English Instructor since 2008. FC: How can your readers reach you and your work? You may find Krista’s novel, Intent on Amazon. Fabricio Correa is a Brazilian-born writer and blogger based in Los Angeles. He holds a BA in law from Universidade Salgado de Oliveira and is currently attending National University’s MFA creative writing program.